Sophie Campbell is determined to be mistress of her own fate. Surviving on her skill at cards, she never risks what she can't afford to lose. 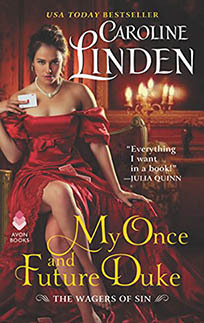 Yet when the Duke of Ware proposes a scandalous wager that's too extravagant to refuse, she can't resist. If she wins, she'll get five thousand pounds, enough to secure her independence forever. Jack Lindeville, Duke of Ware, tells himself he's at the Vega Club merely to save his reckless brother from losing everything, but he knows it's a lie. He can't keep his eyes off Sophie, and to get her he breaks his ironclad rule against gambling. It he wins, he wants her—for a week. The first in the Wagers of Sin series. The second book, An Earl Like You, will feature Eliza. The hero of this book, the Duke of Ware, has been with me for a long time. He was a secondary character in my very first novel, What a Woman Needs, and he popped up again in What a Rogue Desires. In the years since then, I have received more email asking for his story than for any other minor character I've ever written, and I'm so glad to have his story for my readers at long last. Given the connection to my early novels, I included mention of some other characters. Jack pays a call on the Duke of Exeter, the hero of What a Gentleman Wants, and towards the end Anthony Hamilton, infamous gambler and hero of A Rake's Guide to Seduction, makes a brief cameo as well. There's a bonus scene for this book! When Sophie meets Jack's mother the duchess. Read it here. Don't miss my Pinterest board of inspiration for this book. A whisper went around Mrs. Upton’s Academy for Young Ladies soon after tea. A new student had arrived, and she must be of rare family and fortune. One girl caught a glimpse of the carriage waiting outside, glossy black with an escutcheon on the door, and soon the whispers grew fevered: it must be a duke’s pampered daughter, or even a foreign princess. They were wrong. Twelve-year-old Sophie Graham was an orphan, and she was the granddaughter of Viscount Makepeace, not a duke or a foreign dignitary. She also wanted nothing to do with him, and the viscount returned the feeling in full. Within a week of her arrival at his gloomy manor in Lincolnshire, he’d declared that she must go to school as soon as possible. Now she stood silently in Mrs. Upton’s office, listening as her grandfather tried to browbeat the headmistress into accepting Sophie. “The trouble is, my lord, I do not usually accept new students midterm,” Mrs. Upton tried to explain. She was a moderately tall woman, fashionably dressed in subdued colors and devoid of embellishment, and she seemed utterly unafraid of Makepeace. Sophie respected her instinctively for that. Mrs. Upton’s face had grown expressionless during his tirade, but now she took another, more measuring look at Sophie. In the end, something—either in Sophie’s expression or in her grandfather’s final words—overcame the headmistress’s doubts. Sophie was sure it was the money. She didn’t blame Mrs. Upton; in fact she hoped the woman extorted an enormous price. Makepeace would pay anything to be rid of her, as she had learned quite explicitly in the three weeks since she’d been left in his care, and she hated him enough to savor him being rooked for every farthing. “No.” The viscount led the way to the carriage, where Sophie’s small trunk had already been removed from the boot and left on the gravel drive. He stared at her a moment before giving a contemptuous sniff. “A proud little thing, are you? You’ve no grounds for it. If you didn’t bear my name, you’d be as insignificant as your mother.” The viscount climbed into his carriage and snarled at his coachman to go. The carriage started with a jerk immediately. At no moment did Lord Makepeace look back. “He won’t. Nothing I ever do will please him, and I’m glad he’s gone.” She watched the carriage pass through the tall iron gates to be certain that he was in fact gone. “I wouldn’t mind if he were waylaid by highwaymen and shot.” She turned her forthright gaze on the shocked headmistress. “Thank you for accepting me, ma’am. I promise to be a very good student.” And she dropped a flawless curtsy, worthy of the finest ballerina in Moscow—indeed, that was who had taught her. “Are they my age, ma’am?” This interested her intensely. She had rarely had the chance to make friends with girls her own age. “Yes, ma’am.” It stung to be placed in the lower form, but Sophie refrained from informing the headmistress that she spoke fluent French and some Italian, that she loved math and geography, that she knew how to dance and had been playing the pianoforte since she was four. She intended to win over everyone at this academy, and it wouldn’t hurt to hold some pleasant surprises in reserve. Miss Cross smiled nervously and Lady Georgiana gave her an appraising look, as if to say we’ll see. Sophie didn’t mind. She would be circumspect in the other girl’s place, too. But Sophie had inherited her father’s charm and her mother’s drive, and so she set about befriending them. She needed to. Under no circumstances was she going back to Makepeace Manor, where her grandfather ruled in surly silence. Her youth had been spent in the capitals of Europe, following her operatic mother’s career. Her parents’ deaths had upended that happy if unsettled life, leaving her at the mercy of a grandfather who seemed determined to hold her accountable for every sin and slight her parents had ever committed—and in his eyes, they were legion. Sophie soon divined that dying was possibly her father’s worst sin, as he had named the viscount her guardian in his will. If there had been a way to break that will and wash his hands of her entirely, Sophie was sure Lord Makepeace would have done it. Sending her away to school was the next best thing. A young ladies’ academy might not be as exciting as Europe, but it offered the one thing she hadn’t had in all her twelve years: a fixed home. On the interminable drive to Mrs. Upton’s, Makepeace had informed her that she would board at school during holidays if she didn’t get invited home with another girl. Sophie could endure holidays at school, but she yearned for friends. Eliza and Lady Georgiana had great promise in that regard. Eliza was shy and sweet, the sort of girl who would always be steadfast and loyal. Sophie admired that. Lady Georgiana, on the other hand, appealed to her high-spirited side, the sort of girl everyone else admired and looked up to. It didn’t take long to discover that Eliza was the only child of a man with wealth but no connection, while Georgiana was from one of the most august families in Britain, being the much younger sister of the Earl of Wakefield. After dinner the students retired to their rooms to study. Sophie was reading the French lesson—her mother’s language—and feeling relieved there was one class where she wouldn’t be behind, when her new roommates’ whispering caught her attention. “Is it sums?” Sophie asked, spying the page in front of them. “It’s so difficult for me,” whispered Eliza, shame written on her face. Sophie smiled. “I can help.” She rummaged in her trunk and drew out a pack of cards. “Ladies aren’t supposed to play cards.” Lady Georgiana came to sit on the end of her bed, studying the cards with fascination. “Oh yes.” Sophie didn’t add that her father knew because he’d gambled with all of them. When her mother began to lose her voice to a suppurating throat condition, they’d left Europe and come home to England, where Papa put his charm and name to use playing at the card tables to support them. She’d helped him practice the art of appearing to play carelessly while actually calculating the odds of every move. “Six,” said Eliza, staring at the four of hearts and the two of clubs. “And now?” She flipped down a seven of hearts. “Thirteen,” said the other girl slowly. “Good! Now?” An eight of diamonds appeared. “Oh, how dreadful,” said Eliza. Georgiana burst out laughing, and Eliza gasped. “That’s terrible…” But she joined Georgiana on the end of the bed. Sophie dealt more cards and they practiced sums in happy camaraderie. Gradually Sophie began teaching them the rules of the game as well, and then how to calculate odds. Eliza’s confidence grew until she was adding the cards almost as quickly as Georgiana. “What should you do with this hand?” Sophie asked. “Precisely! You’re doing very well,” Sophie assured her, just as the door abruptly opened. Eliza went pale; Georgiana winced and gave an audible sigh. All three girls scrambled to their feet. “What if she wins?” murmured Sophie. Sophie said nothing. She remembered too well the nights Papa had come home late, in dismal spirits, not having won enough. “Yes, ma’am,” whispered Eliza tearfully. The headmistress surveyed them. “Since you are unfamiliar with our rules here, Miss Graham, I shall let this pass. But do not stray again.” She collected the cards and left, dousing the lamp as she did. “A few hands of cards doesn’t hurt anyone. And we were not gambling.” Sophie said a silent prayer of relief that Mrs. Upton had confiscated her old deck of cards and not Papa’s deck. She would have fought like a wild animal to keep that deck—or any of her few reminders of her parents—and that might have got her tossed from school and back onto Lord Makepeace’s mercy. A wave of heartsickness washed over her at the thought of her parents. Four months ago they’d been alive and well, their finances strained but their home happy. Then it all disappeared. Consumption, the doctor said; she was lucky she hadn’t got it, too. Lucky. How she hated that word. Sophie forced herself to inhale evenly and deeply. Everything in life was a matter of chance. Happiness depended solely on one’s own efforts, because Fate was rarely kind or generous. Sophie had learned that early, and she would never, ever forget it. One could never count on luck. Sophie tucked the blankets under her chin as they debated the question. That simple comment, calling her not only clever but by her given name, caused an unexpected warmth inside her. She was all alone in the world now, with Mama and Papa dead, her grandfather an ogre, and her mother’s family a continent away. She vaguely knew she had an uncle or two, and perhaps even cousins somewhere, but none of them were coming to her aid. She might not have any family worth knowing, but true and honest friends would be a good start. And she had a powerful feeling that she, Eliza, and Georgiana were destined to be great friends. Get notified every time I have a new book out!